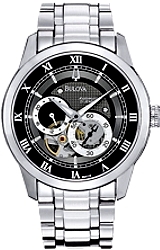 Introducing the all new Bulova 21 jewel Automatic (selfwinding) Mini-Complication Watches for Men, the BVA Series 120. The BVA Series 120 has two subdials, one for the continuous sweep second hand and one for 24 hour time. 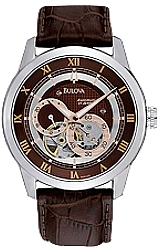 Plus the BVA 120 Series has a see-through "Heartbeat" view of the balance wheel, the actual "heart" of a mechanical watch. 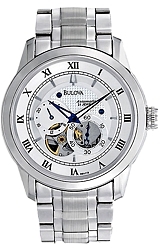 The Bulova BVA 120 Series also has an "exhibition back crystal" so you can view the 21 jewel precision automatic selfwinding movement at work.